AM: In the morning we visit Punta Vicente Roca on Isabela Island. Snorkeling is incredible here as a result of the nutrient-rich waters of the Humboldt Current that bathe the western side of the archipelago. We will have a chance to see colorful fish, sea lions, penguins and sea turtles in the water. AM: Urbina Bay is directly west of Isabela's Volcano Alcedo, where we will make an easy, wet landing (a hop into a few inches of water). We walk on a stretch of three miles (5 km) of the marine reef that has been uplifted by as much as 13 feet (4 meters) out of the water. A highlight of this excursion are the giant land iguanas and giant tortoises, as well as the opportunity to go snorkeling amongst marine creatures, or just relaxing on shore. AM: In the morning we visit Bartolome Island, famous for Pinnacle Rock, where we will see Galapagos Penguins and sea lions. We will also hike a trail to Bartolome's summit where you will be rewarded with spectacular views of Pinnacle Rock and our beach, where the crystal blue waters of the bay cradle your yacht. PM: Afternoon visit to the Highlands, where the dry coastal vegetation transitions to lush wet fields and forests overgrown with moss and lichens. Our destination is the Tortoise Reserve, where we will have chances see these animals in the wild. AM: Española, also known as Hood, is the southernmost island of the archipelago, and is one of the most popular due to the breathtaking variation and number of fauna that inhabit the island. 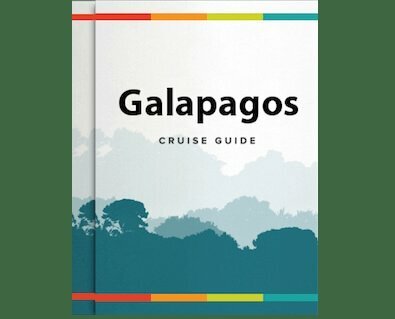 In the morning we visit Punta Suarez where you will witness the largest variety of marine iguanas in the Galapagos, masked boobies and blue footed boobies nesting along the cliff's edge, as well as the nesting site of the famous waved albatross.